Forced by financial hardships to write, Fanny Trollope, who died 150 years ago tomorrow, produced 40 novels and travel books at the rate of two a year. “Let it be as bad as it will, I shall get something for it,” was her attitude. She was a natural. That she could rescue her debt-ridden menage this way was remarkable, but she also managed to voice principles and her instinct was always to defend the underdog. She was a feminist before the word existed. She wrote one of the first novels in English about American slavery – The Life and Adventures of Jonathan Jefferson Whitlaw (1836). In Domestic Manners of the Americans, she railed against the injustice meted out to Native Americans, too: “You will see them one hour lecturing their mob on the indefeasible rights of man, and the next driving from their homes the children of the soil, whom they have bound themselves to protect by the most solemn treaties.” Trollope was one of those foreigners not taken in by the American dream: she came, she saw, and she returned to Europe (although for a time she was stuck in Cincinnati). The woman was undeniably brave, but what I like most about her is her curiosity. She talked to everybody and visited everything: mountains, cottages, waterfalls, schools, prisons, Viennese catacombs stuffed with corpses, and Congress, employing every means of travel then available (donkey, steamboat, raft, carriage). She also had an eye and ear for the telling detail. Americans, she observed, were always spitting and never thanked anybody, and alligators actually ate people. Collections of newspaper columns must be the least enduring or interesting genre of books in the world: the phrase ‘yesterday’s news’ was invented for a reason, after all. Franklin Adams, Richard Harding Davis, Russell Baker and Geoffrey Bernard read like damp toast now, unless you are obsessed with a particular topic or you’re just weird and you like newspaper writing. This gathering from Mohsin Hamid – there’s hardly a piece of more than a page and a half – is a dip into a drawerful of essays he’s written over the past decade or two, for some of the better newspapers and magazines. They’re so short that they all look the same: a question of some pertinence is raised, discussed at middling depth, and a zinger is appliquéed at the end, in the tiresome way of all journalistic ‘think pieces’. And the title? Ping! Appearance of the dreaded pun-lightbulb. This collection is blessedly non-chronological: in going through his cogitations, Hamid discovered he had been concerned over the years with a few themes, coming back to them every so often as if on a journalistic roller-coaster: family, life, literature, politics. Politics is where he should stay. In a good piece, ‘After Sixty Years, Will Pakistan be Reborn?’, Hamid talks about the atmosphere in his family and in Pakistan at the time of its birth: ‘1947 is also remembered as a time of enormous hope. My great-grandfather survived [a bigoted attack]. And the birth that year of his grandson, my father, marked the arrival of the first generation of something new: Pakistanis. ‘My mother recalls a decade of sugar and flour rations. The 1950s, she says, were a decade of a young country finding its feet. She grew up in a small town and she describes a fierce love for Pakistan felt by her and her schoolmates. Pakistan was theirs, a source of pride and identity, symbolically both a parent and, because it inspired such feelings of protectiveness, a sibling.’ Only think. It’s galling and humbling to read this in the light of our recent spectacular failure to secure our own freedom, especially because all we had to do was pick up a pencil. It’s clear that no one read Discontent and Its Civilizations from start to finish after it was pasted together. Statistics are repeated from one essay to the next, as are certain words, which quickly lose their power to arrest and charm. Much of what Hamid has to say just isn’t very striking. But there is one supremely important essay here and it is called ‘Why Drones Don’t Help’, published last year in the New York Review of Books. Hamid’s thinking seems to have been shaken awake for this piece, even though to some extent it is a book review. It’s a little longer than his usual efforts and he does benefit from a little elbow-room. So for this piece alone, it turns out that this slapdash book should be read by everyone. But it would have been a much better idea to publish ‘Why Drones Don’t Help’ on its own, in twenty-point type if need be, and put it at the till of every bookshop in the west. Even in Tesco. This review appeared in the National of 29 December. I never had a doll’s house. I had trolls, those frizzy-haired rubber toys of the 1960s. It says a lot about the state of things in the West at the time that this was the image of humanity little girls longed for: splay-footed, slap-happy mutants with six fingers each. One Saturday afternoon I made rudimentary rooms for my trolls out of shoe boxes, labelling them ‘LIVINGROOM’, ‘KITCHEN’, etc. I had the crazy idea that photographs reverse everything, like mirrors, so I wrote all the signage backwards. Then I photographed my trolls standing dully about in these sparse dens. The resultant photographs were blurry, but not blurry enough to hide the signs saying ‘NEHCTIK’ and ‘MOORGNIVIL’. I’ve moved on from trolls to an interest in presepi, those miniaturized Neapolitan nativity scenes. It’s not the figures I like (caricatures of nineteenth-century peasant folk), nor the elaborate tableaux (complete with real fountains and lighting), nor all that manger business. It’s the touching imitations of food: mini strings of garlic, inch-long boxes of silvery sardines, baskets of lemons, or oranges, frilly-leafed lettuces, little purple artichokes… I own a four-inch-high bread stall, piled with loaves; a meat stand, garlanded with sausages; a fishmonger’s (with prices! ), offering mounds of microscopic oysters, mussels, clams, and a lobster (2 euros). All of Italian produce is there, mouse-sized not mouth-sized (of course Beatrix Potter’s badly behaved mice were disappointed by their inedible English fare). Another obsession is the Mexican Day of the Dead. Amongst my many small artefacts are a cowboy on a horse, honeymooners in a car, a naked lady in her bath, a glamour-girl admiring herself in the mirror, a few guys in coffins, and a happy barking dog. All skeletons, and all having a whale of a time. The Mexican afterlife is a blast, and makes it possible to think about the dead without descending automatically into grief. It’s hard to make death or sculpture funny but these artists manage both. Funny and tiny. Is it just that we like baby anything? We like kittens, lapdogs, ducklings, panda cubs, Bonsai, toy trains, computer chips, dieting, downsizing… Anything shrunk, we’re there! Oddly, shrinking the world somehow magnifies it. But there’s a dark side to miniaturism too, even at its cutest. It’s for people who feel small, fearful and angry. Children need tiny people – dolls – they can bully. They need an outlet for the aggression their own vulnerability generates. The weird mini crime scenes of Frances Glessner Lee from the 1930s are littered with bloodied corpses or cloth dolls hanging from nooses made of cotton string. Not meant as toys, nor even as sadistic fantasies, these were supposed to be police training aids, based on real events, and they’re doggedly dreary. Glessner Lee had problems with scale: the fabrics always look wrong. She’d hitch up a sash curtain that in real life would be thick as a tarpaulin. Now that is scary. Narcissa Thorne was more precise about the details, and devoted much time and money to fabricating miniature historical interiors, now housed at the Chicago Art Institute. 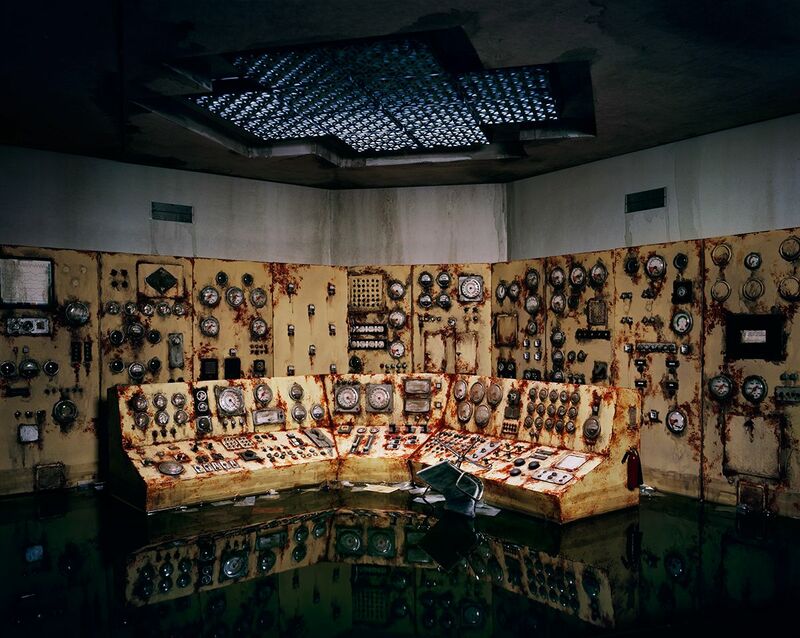 It’s no surprise that the sculptor and photographer, Lori Nix, makes a beeline for these miniature rooms whenever she’s in Chicago. Like Nix’s latest work, there are no people in the Thorne rooms. Unlike Nix’s though, Thorne’s interiors are neat and tidy, ship-shape. Nix revels in dirt, shabbiness and decay. 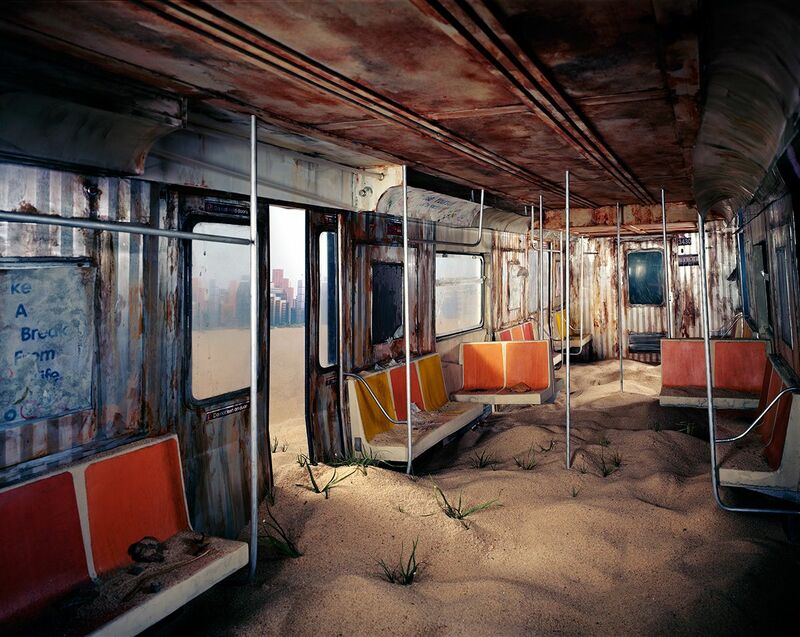 Lori Nix makes miniature dioramas of communal spaces which she then photographs. In constructing them, she has the help of her partner, Kathleen Gerber, another sculptor. Gerber acts as ‘the voice of “no”’, Nix jokes. ‘I have to talk her into doing things!’ But together, over the course of many years, they have produced an incredible body of work from their Brooklyn apartment/studio. The latest creations have appeared in exhibitions and now in a book, The City. Much use is made of foam sheets from the hardware store (carved, glued, sanded and coloured), postage stamps, miniature tools, bakeable polymer clay and Vac-U-Form kits. Meticulous and tiny thought hey are, the results aren’t exactly meant for the miniature enthusiast. These intense narrative scenes, ranging in size from eighteen inches to more than eight feet square, are designed purely for the photo shoot. Exposures can take up to half an hour, with Nix ‘sculpting’ the lighting. Later the dioramas are dismantled. The attention to detail is magnificent. I can’t get over the clothes hangers in “Laundromat”, or the tiny single-wash detergent boxes that lie about the floor, and the faded notes stuck on the wall (advice and admonitions to long-gone laundromat-users). The peeling poster of a tranquil forest glade is nicely ironic amid the global-warming machines below, and beside the shattered window a poignant cactus thrives. Nix used a real cactus here, allowing a rare convergence between the big and little, the real and the fake. These pictures are beautiful, beguiling – and violent. They tell stories of apocalypse (reflecting Nix’s love of disaster movies) and the power of nature (she grew up amid floods and tornadoes in Kansas). Something terrible has happened here, from the human point of view, a calamity one suspects was manmade. 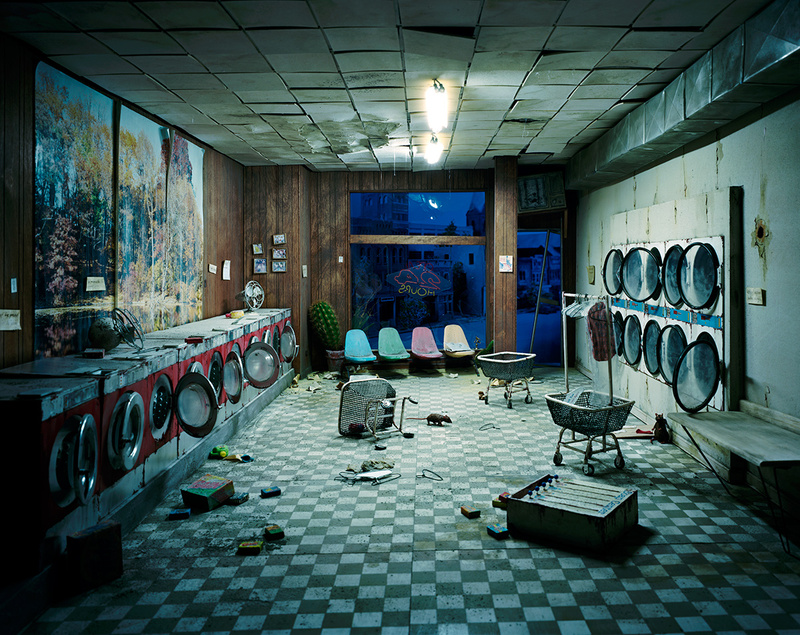 Did everyone scatter in distress, depart stunned in orderly fashion, or were they just vaporized by a neutron bomb that kills people but leaves laundromats intact? But the buildings too are starting to crumble, for lack of maintenance. Stuffed birds look on as real birds arrive. Books languish unread in a library, while trees grow out of the floor. Flamboyant jungle plants pose in a dishevelled mall; water and rust have put an end to the sinister activities of a computer control room; a sand-filled New York subway train has merged with the desert beyond; and crows take the stage in an abandoned theatre, nobody left to applaud them. The violin repair shop looks remarkably unscathed, but cobwebs are spreading under the table, and the view outside reveals bombed-out buildings. In “Beauty Shop”, the ‘beauties’ have apparently escaped, but the place itself has been ravaged. There’s a hint of 9/11 in the yellowed pieces of paper on the floor, and the rust on the chairs is like blood. Something chaotic, terrifying and tragic has happened here – quite like many hair salons I have known. Vaguely humanoid Hoovers await an invasion of plantlife, not purchasers, in “Vacuum Showroom”. Where in the end, Nix suggests, will all our marketing, our manufacturing, our dust-sweeping get us? Perhaps the only way the balance of nature will be restored is if we’re banished from it. ‘We are on the cusp of no return in terms of the environment,’ says Nix, whose work has also been used in a short ecological film about the fish industry (The Story of Sushi). ‘Many of those in power don’t really want major change because it would mean the end of the profitable times for them…Modern humans have great difficulty thinking of the long term. We are myopic and selfish, our priorities are askew…’ Nix has hopes of technological breakthroughs in the future, but only if we put more emphasis on education. 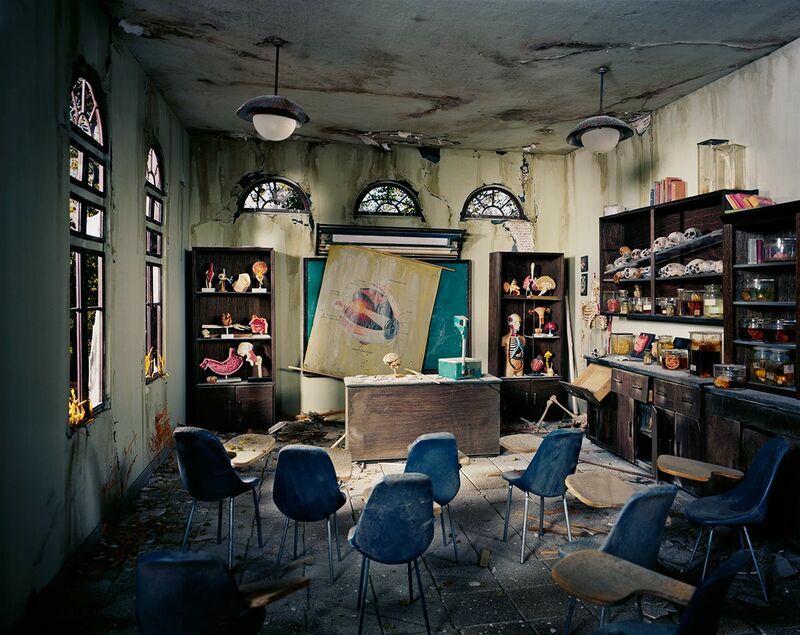 In “Anatomy Classroom”, what was once an established place for learning is now deserted, as if everybody fled one day from some nutso gunman, never to return. Chairs have been tipped over, the diagram of the eye is damaged and dangling, and the pickled brains are running out of formaldehyde. Sombre blues pervade, and purples, punctuated by the red and yellow of internal organs: pristine models of a uterus, lungs, liver, thyroid, heart, colon, ear and hip. But there’s no need to study medicine if human beings no longer exist! The broken windows instead give a telltale Nixian glimpse of the outdoors. Nature has finally had its revenge in The City: humans have fled, leaving their map rooms, malls and museums to the whims of plants and animals. It seems only fair. We’ve done enough desecration. But somebody save the presepi! 2. Pinched, unnatural ‘waxy’ look. 3. Slept in sealed glass chamber. 4. Crowds queued for days in order to see. 6. Rounded up and kept thousands of animals in private zoo. 8. Likeness available on hundreds of products. 9. Insisted on being called ‘King of Pop’. 10. Thriller second biggest album in history. 11. Thriller is 13-minute horror video. 12. US schoolchildren voted him best hero of 1980s. 13. Had sister’s nose (mail order). 14. Signed biggest record contract in history. 3. Sleeps in sealed glass chamber. 4. Crowds queue for days in order to see. 6. Rounded up and kept thousands of people in prison. 9. Insisted on being called ‘Father of the Soviet State’. 10. USSR largest nation in history. 11. Term of office was 13-year horror. 12. Russian schoolchildren voted him best hero of 1900s. 14. Signed 3rd largest number of death warrants in history.